As the sun sets on the oceanfront of the Naples Ritz Carlton, guests enjoy a longstanding tradition of toasting to the end of an amazing day on their private balconies while admiring the descending sun. Situated by the Gulf of Mexico, the five-star luxury hotel accommodates 450 guest rooms including 35 suites and 70 Ritz Carlton Club Level rooms. With an exception to the rooms with a limited view, all rooms have a view of the gulf in an addition to a personal balcony. Guests can venture out to explore the countless restaurants that the Ritz Carlton has to offer. Get dined and wined by the waters while enjoying a front row seat to the spectacular evening sunsets and let The Ritz Carlton Naples tantalize all of your senses. DUSK, a Japanese restaurant, puts a modern spin on the classic boardwalk hideaway. Guests can take a pick from their innovative cocktail menu which showcases traditional Asian ingredients blended with seasoned favorites and fruits. A standout on the menu is a 12 year Nikka Japanese Whisky ended with lemon, maple syrup, and Malbec to make the most enchanting whiskey sour. With its chic decor, the restaurant attempts to capture the beach’s atmosphere at twilight for guests to enjoy indoors. With gentle Gulf breeze drifting through the palm trees, escape to one of the most soothing spas in South Florida. The spa’s amenities include a rejuvenating and healing steam rooms, saunas and aqua lounges, along with an outdoor mineral pool to complete the holistic experience. As the ladies enjoy a day out at the spa, men can sweat it out on the courts. The golf resort features four courts and offers drills, clinics and personal instruction from USPTA certified tennis professionals. If tennis isn’t your cup of tea, take a swing on the lush greens at the Tiburón Golf Club, with 2 18 hold Greg Norman designed golf courses which is also home to the LPGA’s CME Group Tour Championship. While parents can enjoy a well deserved break, the children can entertain themselves at Vue which features popular video games played via consoles hooked up to 40” Samsung LCD TVs from Microsoft XBox One game stations with wireless controllers, to Sony Playstation 4, and the latest from Nintendo Wii. Encouraging family-friendly fun and adventure, the hotels offers a range of activities and attractions for all ages. Guests can enjoy a morning walk down to the natural preserve of mangroves and palms and spend the afternoon out in the sun by parasailing and kayaking out in the waters. Guests have the option to rent stand-up paddle boards, body boards and waverunners. For a unique experience take the poolside glass blowing class where you can design a keepsake piece taught by Conrad Williams, a Dale Chihuly trained glass artist. Guests will choose from a rainbow of colors and work beside the artist forming molten glass with their breath and shaping tools. The experience is offered poolside at the beach resort Thursday – Sunday. 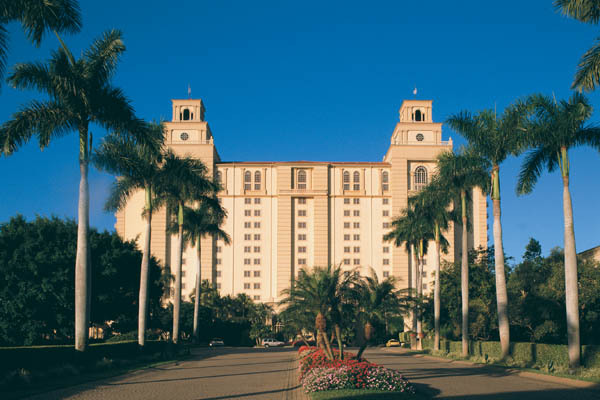 Whether you’re contemplating heading to Ritz Carlton, Naples for your honeymoon or to take your kids on a vacation, the five-star hotel’s world class amenities with a variety of spring beach or spa packages available that are a perfect respite from the Northeast polar vortex.